To-ji Temple, Kyoto- By Day and By Night | Travel? Yes Please! The rain was coming down hard during our visit to To-ji Temple, but not enough to conceal its simplistic beauty. Finding shelter under our umbrella, we dodged puddles as we walked down the gravel path. 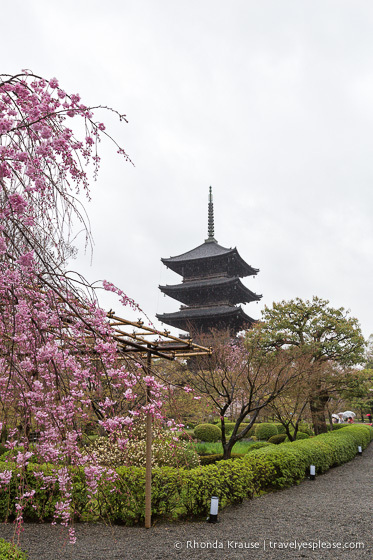 Pink-blossomed cherry trees lined its edge, leading the way to To-ji’s five storied pagoda, a symbol of Kyoto. As we approached the pagoda, I immediately noticed how dark and drab it appeared compared to other pagodas we had seen in Japan. Don’t let its no-frills appearance, fool you- this pagoda has been an important piece of To-ji Temple’s history. To-ji Temple dates back to 794, when it was founded at the start of the Heian Period. Soon after the capital of Japan was moved from Nara to Kyoto, two guardian temples were built at the south entrance to the city. The Sai-ji (West Temple) no longer exists, but thankfully the To-ji (East Temple) remains. In 823, Emperor Saga decided to honour Kukai (Kobo Daishi), the founder of Shingon Buddhism, by giving him the temple. Under Kukai, To-ji Temple went on to become one of the most important Shingon temples, second only to the sect’s headquarters in Koyasan. Kukai added the pagoda in 826 and some wooden halls to house many important statues of Buddha. A lot of the buildings have been damaged or destroyed over the years by earthquakes and fires, but they have been rebuilt according to the original layouts and architectural styles. To-ji Temple was inscribed as a World Heritage Site in 1994 as part of the Historic Monuments of Ancient Kyoto. One of the first things we saw after entering To-ji Temple was a gorgeous large weeping cherry tree, its delicate blossoms in full bloom. I had seen so many pictures of this tree with the pagoda in the background, that I was almost giddy to finally be able to take a photo of my own, even though the rain did ruin the clarity of my shots. To-ji Temple turned out to be a great place to view cherry blossoms in Kyoto. Besides the huge weeping tree, there were cherry trees that lined the paths and surrounded the pond. It was hard to tear myself away from the cherry blossoms and pretty garden, but eventually we made it to the temple’s main attraction, the Five Storied Pagoda. The pagoda may not be as embellished as some others in Japan, but its dark wood reflected a simplicity that is often missing in our modern world. I appreciated that it looked as old as it was (this version was built in 1644) and wasn’t painted to look all shiny and new. What the pagoda may lack in colour, it makes up for in size. To-ji’s five storied pagoda measures 57 metres (187 feet), making it the tallest pagoda in Japan. The pagoda is rarely open to visitors, so we weren’t able to go inside and see the four Buddha statues surrounding the main pillar. Instead we headed to the Kondo, To-ji’s main hall. The Kondo Hall is the largest structure in To-ji. It houses a large statue of Yakushi Nyorai (Buddha of Medicine) flanked by his two attendants Nikko (Bodhisattva of the Sun) and Gakko (Bodhisattva of the Moon). We didn’t spend too much time at To-ji Temple because we knew we were going to come back on another day to visit in the evening. During cherry blossom season the temple and its garden are illuminated by lights making for an extra special sight! When we arrived for our night visit to To-ji Temple, we were surprised by the huge lineup to get in. It was a few blocks long, spanning almost the entire length of the temple! Luckily the line moved fast and it wasn’t too much of a wait until we were inside. To-ji Temple was a completely different experience at night. It was quite crowded, especially around the weeping cherry tree, but I still loved the mood created by the lights on the cherry blossoms and pagoda. Under the lights, the pagoda looked as if it had undergone a complete transformation. Now it appeared to be made of gold, instead of plain, dark wood. In fact, it looked as golden as Kinkaku-ji Temple, which is covered in actual gold leaf. It’s amazing what good lighting can do! I’m really glad we decided to visit To-ji Temple at night because it was one of the highlights of our three day trip to Kyoto. Not only that, it was fun to have two different experiences- a peaceful daytime visit and a night visit full of anticipation and excitement to see the illuminated cherry blossoms! Here are some more photos of To-ji Temple for you to enjoy! To-ji Temple is located southwest of Kyoto Station. It’s about a 15 minute walk from Kyoto Station or a 10 minute walk from To-ji Station on the Kintetsu line. Admission to To-ji Temple is usually 500 yen, but there are different prices depending on what time of year it is/what buildings are open for special viewing. For more information, visit To-ji Temple’s website. The cherry blossom evening illumination at To-ji Temple usually happens sometime during the last two weeks of March and first two weeks in April. The event runs from 6:30 pm- 9:30 pm and costs 500 yen. To search for hotels near To-ji Temple, please visit Booking.com, our trusted booking site that we use for all our trips. Accommodations booked through the included link earn us a small commission, at no extra cost to you, and help support this website. Thank you! Frank - I can never get over those trees. Amazing.